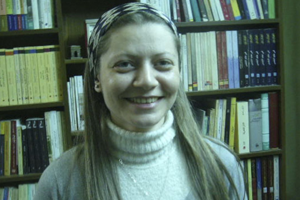 Syrian human rights defender Razan Zaitouneh turns 39 today. She was kidnapped in December 2013 with three colleagues—her husband Wael Hamada, Samira Khalil, and Nazem Hammadi— by the armed group Jaish al Islam, one of the powerful militia groups working near Damascus. They have been missing ever since, some of the many human rights activists and others who have been “disappeared” in Syria in the last five years. Zaitouneh is an outstanding lawyer and civil society leader who founded several human rights groups. She’s been defending Syrian political prisoners since 2001. When the conflict began in March 2011, she created a website, the Syrian Human Rights Information Link, which became one of the few sources of information on killings, arrests, and human rights violations by the regime. She’s played a vital role for many years protecting independent human rights groups in Syria. With other activists, she established the Violations Documentation Centre to monitor human rights violations and record casualties in Syria, and she co-founded the Local Coordination Committees, a network of civilians coordinating local committees reporting on protests in various cities and towns across the country. Because of her work, she was targeted by the regime, and by opposition groups that also systematically violate human rights. It’s not clear if Jaish al-Islam still holds her and the others. Some believe they are now be held by the Al Qaeda affiliate, Jabhat al-Nusrah. We don’t know where she is but we know what she is, a powerful emblem of disappeared human rights activists in Syria, an unusually driven and likable activist. “She was into poetry and reading at a really early age – when I was a teenager she would sit and listen to poetry on the radio with me,” says her sister Rana, who is eight years older. “She was quiet, an obsessive reader. More of a listener than a chatterbox. She wanted to be an astronaut when she grew up." Zaitouneh’s writings are a powerful mix of focus on individual cases and an analysis of the macropolitical forces crushing Syria. “The West’s strategic interests should not overcome what remains of its humanity. Even if the West continues along the same route, we will not allow that decision to destroy what is left of our determination to continue our revolution till the end,” she wrote in a blog dated October 2013. Her work was widely known before her abduction, and was recognized with major international awards—the Sakharov Prize for Freedom and the Anna Politkovskaya Award. On Wednesday it was announced she has been shortlisted for the 2016 Martin Ennals Human Rights Defender Award. Jaish Al-Islam is supported by the Saudi Arabian government. Although Secretary of State John Kerry and US Ambassador to the UN Samantha Power have both paid tribute to her work and called for her release, President Obama failed to raise her case publicly when he visited the Saudi king last week. If Razan is to be back at work before her 40th birthday next year, Washington needs to do more to press its allies the Saudi Arabian government to urge the Syrian opposition groups responsible for her abduction to release her and the others.